I have to say as a doctor I understand the duty and indeed the privilege it is to look after patients and to have their trust. As a politician I equally understand my duty and privilege to have the trust of the people who voted in me ..and everybody here who has been elected by their people to protect them and do the right thing by them. I want to say as a doctor I too understand the term negligence. Not doing the right thing or giving the right treatment when you didn’t know because maybe you didn’t keep up to speed or keep abreast of changes – and that is negligence. But it is nothing to the negligence that is committed when you know the right treatment is there and you don’t use it. Worse forms of negligence than this. I’d agree with all of this in general terms, but can go further. He identifies two types of negligence: ignorant negligence and wilful negligence. I’d add a third category – the worst kind. This is when you knowingly stop someone else doing the right thing or accessing the right treatment, even though you know they would benefit from it and would be willing to use it. That abusive act can be compounded by exaggerating its risks and diminishing its benefits, with the purpose of turning people away from a product that would help them. Let us call this: wilfully abusive deceitful negligence. And there’s a lot of it about. When politicians involved in tobacco policy start talking about the ‘negligence’ of those they disagree with, they need to confront their own shameful and negligent determination to ban snus, a product 95-99% less harmful than smoking and responsible for a great public health success in Sweden. This is a case of wilfully abusive deceitful negligence. Abundant data. 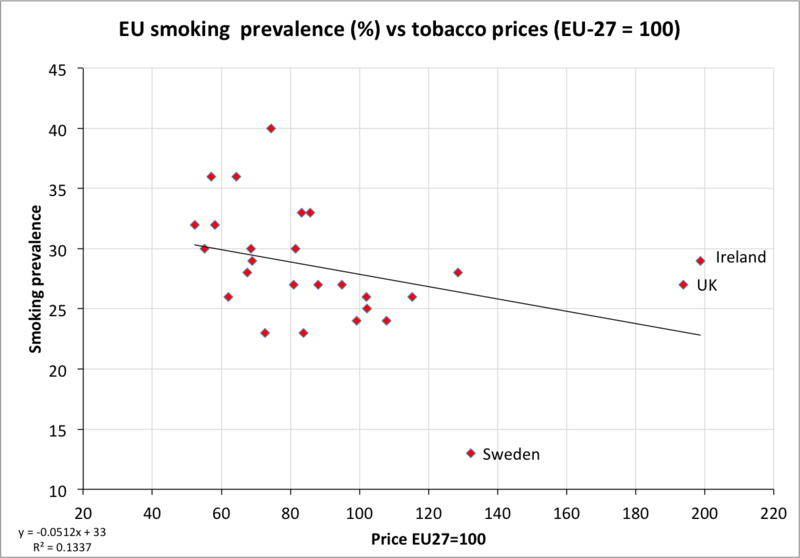 The low rates of smoking in Sweden, and the low rates of smoking related disease in Sweden. And the rapid fall in smoking in Sweden – OECD data. All attributable to snus. 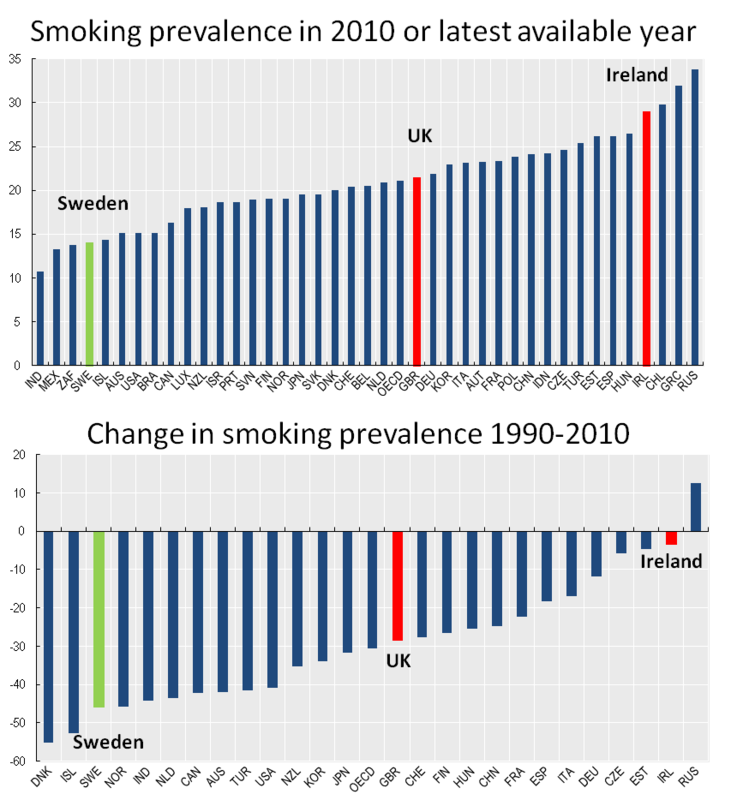 The case that ‘harm reduction’ is a more successful health strategy than other forms of tobacco control – see this response to the WHO recommending UK and Ireland as exemplars of tobacco policy and the graphic on taxes above. Sweden and snus win by some distance. A letter to the Swedish health minister, circulated to all countries in the European Council and the presidency on 15 February 2013. This sets out the case in brief and is signed by five respected experts in the field and me. Royal College of Physicians. Harm Reduction in Nicotine Addiction. Helping People Who Can’t Quit. A report by the Tobacco Advisory Group of the Royal College of Physicians, October 2007. Sees a role for regulated oral tobacco as part of a wider market for risk-reduced nicotine products. SCENIHR. Health effects of smokeless tobacco products, Scientific Committee on Emerging and Newly Identified Health Risks, European Commission, Brussels. Clearly, articulates the harm reduction argument, dismisses many of the counter-arguments and at no point justifies banning snus, even though this report is used selectively and inappropriately by the Commission to justify its stance. To put it mildly, there is an overwhelming case to allow smokers access to low risk smokeless tobacco products as a harm reduction strategy for those who wish to continue using nicotine or find it hard to quit. At an individual level it is abusively negligent to deny a smoker this choice. At a population level where the product is in widespread use, as in Sweden and Norway, we know it works to reduce the overall rates of smoking and the burden of disease. The European Commission. There are few printable words that can do justice to the cynicism and extreme negligence of the European Commission when it comes to snus. They originated the proposal to keep snus banned outside Sweden (Article 15), as it has been since 1992. They compounded this egregious error with an attempt to ban flavourings, knowing that these are integral to the public health success of snus within Sweden (Article 6.1 and 6.10). And to cap it all they want warnings that do nothing to convey the relative risk of smoking and smokeless use (Article 11). They showed themselves immune to evidence and argument: first they ignored advice from experts, then they ignored a brutal critique (see: Massaging the data to fit the policy) of the Commission’s negligent and contrived Impact Assessment for their wretched snus proposal, managing only an aloof dismissal full of non sequiturs. The European Council and especially the Irish Presidency. Despite the passionate prose above about duty to protect, professional negligence and the primacy of voters and patients, the Irish Presidency circulated a fundamentally negligent General Approach paper, to gain agreement to a broad common position on 18 June 2013. Article 15 (p.52) of this paper seeks a common position on banning snus outside Sweden – leaves the Commission proposal unchanged. The Presidency also forced Sweden into a negligent trade-off between a principled stand to protect health outside Sweden by lifting the ban, and a pragmatic approach to protect health within Sweden by removing the proposed ban on flavourings. To protect flavourings in Swedish snus, the Swedish government was bullied into giving up its opposition to the ban on snus and forced back into the collective negligence of the Council position. I don’t blame them for that, it is down to outrageous constitutional overreach by the Commission, backed by the negligent Council. The European Parliament. At least there are emerging signs of open-mindedness and scepticism emerging among the various committees providing opinions to the lead committee – links provided to those available at the time of writing. Agriculture and rural development AGRI committee opinion: Snus should be “regulated” instead of “banned” in the EU. Legal Affairs JURI committee opinion: Snus should be allowed in countries where snus is traditionally used (i.e. Denmark and Finland). Also snus should not be subject to flavoring regulations. Industry Research and Energy ITRE committee opinion: Snus should be allowed in countries where snus is traditionally used. But Linda McAvan MEP the rapporteur for the lead committee (Environment Public Health and Food Safety – ENVI) told me in February that ‘there is no chance of anything happening on snus‘. This was before she had the opportunity to acquaint herself with the evidence and apparently without realising that the role of a rapporteur is to investigate and make sound evidence based recommendations to the Parliament. Her draft report simply endorses the Commission proposal without comment: a negligent response to a negligent proposal. Fortunately, she has the opportunity to do the right thing on 10-11th July, when the ENVI committee debates the directive and votes on amendments, which include options to lift the ban and to replace it with regulation of all smokeless tobacco toxicity. The UK government. A special mention… How has a supposedly liberal-minded, market-orientated coalition government keen on personal responsibility somehow concluded it is better that people in Britain are denied by law the option to radically reduce their own tobacco-related risk, on their own initiative, at their own expense, and with no harm to anyone else? And this despite an abundance of evidence and argument to the contrary from UK-based experts like the Royal College of Physicians. Even if only 20 people in the UK wanted to use it, why would the British government stop them? World Health Organisation. A disaster area of professional negligence. The WHO paper produced for the FCTC COP-5 on smokeless tobacco is truly appalling – not even a flicker of recognition that low risk products might be useful – just a desperate attempt to find arguments to the contrary, all of which are unsupported by evidence. I wrote an open letter to WHO and delegates to the FCTC meeting to address these points, and many experts joined in expressing similar sentiments I have already commented on the approach of WHO-Europe to snus in front of the European Parliament, and await a reply. The participants spoke in favour of keeping the ban on oral tobacco (snus) and extend the ban to other smokeless tobacco products (chewing and nasal tobacco). No serious effort has been made by this Brussels insider community to justify the case for banning snus – at best they refer to the Commission’s wholly inadequate justification. Negligent basically. Cancer Research UK. A special mention as the CR-UK negligence is astonishing given their resources. Believing their tobacco policy function to be an anti-scientific propaganda operation, I wrote to the CR-UK Chief Scientist, Professor Nic Jones of Manchester University, hoping that there would be someone in a position of responsibility who would pursue the issue with scientific integrity. I was wrong. Here is the exchange – basically they didn’t want to take it seriously and look into it properly. Despite Sweden having by far the lowest rates of lung cancer in Europe, they deny there is anything useful to be learnt here. The exchange stopped after my rejoinder to what I considered a woeful anti-scientific PR position served up by way of response. When you have a board role in an organisation (the Scientific Executive Board in this case), you have certain duties to challenge the organisation’s received wisdom, not just to repackage it to fend off criticism. Cancer Research UK – complacent and negligent about cancer in my view. …every new form of tobacco on the European market increase the dependency of tobacco and all forms of tobacco are harmful. On the other hand, the Swedish National Institute of Public Health supports keeping the ban on oral tobacco with the argument that the introduction of every new tobacco product on the EU market increases the dependency and all forms of tobacco is damaging to health. The Commission also draws on the support of the Swedish National Institute of Public Health in its letter to me. So the Commission use the Swedish National Institute for Public Health as if it has made an expert endorsement of their position, but the actual argument used by the institute is childishly simplistic. It’s pure PR by the Commission. I think there is a mutually reinforcing alliance of wilful, deceitful, abusive negligence on snus – a conspiracy of insiders against the health of ordinary people. And not just through casual indifference – but through actively preventing, by law, access to products two orders of magnitude less risky than the market norm. 1. Civil service organisations, like the European Commission, often overvalue consistency and internal coherence, or ‘being right all along’ – showing that was has been done up to now was right and continues to be right. They do this at the expense of external coherence and responding to changing understanding and evidence. So there will be a bias against changing the position established in 1992 unless it really needs to be changed. They should follow the wisdom of Keynes: When the facts change, I change my mind. What do you do sir? As a former civil servant myself, I am appalled by the Commission on this issue – they should share something like the UK civil service values of honesty, integrity, objectivity and impartiality. But they don’t when it comes to public health and tobacco, and especially not snus. 2. Health campaigners. Many health campaigners have a comfort zone that pervades their professional ethos – implacable opposition to the tobacco industry in an shape or form. Such good-versus-evil certainties do make life easy for a campaigner. A simple model in which people, especially children, are helpless victims of predatory businesses, with a ‘hook and hold’ model of addiction underpins the business model. Never mind teenage experimentation and adult initiation, adult choices and free will, functional benefits of nicotine or anything else that is reality based, but difficult. The logic goes: snus is a tobacco product, snus is made by the tobacco industry, we oppose the tobacco industry, we must oppose snus. Fake public health arguments are then brought in to shore up this lazy logic – gateway effects, dual use, overcoming smoking bans, addiction are emphasised to protect the comfort zone from ambiguity and stress-inducing complexity. 3. Governments perceive it is politically difficult to unban a tobacco product and worry they might look weak on public health – and they fear criticism from health campaigners, and there is no constituency to applaud their bravery in doing the right thing. They are held hostage by arguments about the gateway effect, even those these are fallacious – see: We need to talk about the children – and other distracting PR gambits thrown up by the public health community. On the other hand it is politically easy to oppose tobacco companies and look tough on tobacco by banning things. So the starting point will be a bias in favour of the status quo. 4. MEPs are lobbied by the Brussels based lobbyists of the health charities and their alliances – and generally prefer to be able to tell their electorate that they are friends with Cancer Research UK rather than BAT or Swedish Match. The exclusion of the tobacco industry (through the Article 5.3 of the FCTC and guidance) leaves almost no-one able to make the case for these products on public health grounds as they would be smeared by association. “This document arises from the European Public Health Alliance which has received funding from the European Union, in the framework of the Health Programme. Sole responsibility for this position lies with EPHA and the Executive Agency is not responsible for any use that may be made of the information contained therein. Unsurprisingly the EHPA finds itself in near total agreement with the Commission, wishing only that the Commission could go further. Exactly what the funder would want – probably just a coincidence… a meeting of independent minds. No-one would take the protestation of independence from the funder seriously if the funder was a commercial entity. Pharmaceutical money is circulating liberally and has an insidious effect – take the multiple competing interest of the European Respiratory Society, all of which go unmentioned in its position statement on the TPD. Snus is a competitor to NRT and the other medical products and is more effective and more widely used for smoking cessation in Sweden. ERS supports banning it. I don’t want to overplay the money side: judging by some comments on this blog, there are people who think it explains everything. I think there is a wider set of incentives and cultural factors at work, and money simply rewards and reinforces these. 6. Cancer and other health charities are culturally inclined towards biomedical responses to health problems, and are above all formidable fund raising operations. They have a simple proposition – >> raise money >> do brilliant research >> find miracle cures. They are not really comfortable or capable with the messy optimising compromises of harm reduction. Their tobacco policy functions are not really part of their mainstream efforts to tackle cancer, cardiovascular disease, and respiratory illness. They are more like opportunities to expose their brands to the public in an area of considerable news interest. They do this by taking apparently strong paternalist protective positions that work well in the media and look good to potential funders, but are actively harmful because they deny the potential of user agency and harm reduction. 7. Academics. Those academics hostile to snus, e-cigs and harm reduction approaches generally can expect funding from organisations who are similarly hostile. Research funding bodies – like Cancer Research UK – which also have advocacy positions on issues relevant to research they are funding are a source of serious undeclared conflicts and subtle pressure on academic commentary. Where campaigners have noisy and aggressive campaigns to ban snus or over-regulate e-cigarettes, a expert who sees the issue differently may feel the risk of criticism or being ostracised means it is not worth speaking out. 8. The current users of snus are few and mostly concentrated in the one country that is allowed to sell it in the EU. The potential beneficiaries are current smokers who don’t really know they are being denied a potential game-changer and life-saver. They aren’t going to make much noise – they are missing something they never had. [This is quite different with e-cigarettes of course]. Swedish ex-pats always get it somehow. 9. The ‘victims’ – people who die or get ill because they smoked when they would otherwise have switched to snus, used it to quit, or used it instead of smoking from the outset – are dead or if alive they perceive the fault to be their own for smoking. They should be able to blame those who wilfully and abusively denied them better choices. However, as individuals they don’t know if they personally would have taken those choices had they been available. They can’t sue or blame any of the actors above. I have been appalled by the way some in public health treat this as a game, something to do to upset Swedish Match or part of their silly Dalli conspiracies. They either don’t realise or don’t care that these are real lives lost that would otherwise not be. You can easily see how all these influences, incentives and interactions will lead to a self-reinforcing wilfully abusive negligent response to snus. That is why I found it hard to endure the trite little sermon on negligence and duty from the Irish presidency. Thank you for this well-presented analysis of the EU-Snus situation. I am glad to see you abandon professional courtesy and say what you think about those denying smokers the right to life. However, I’m afraid to say that I can’t agree with your basic premise as to the reason why bans and over-regulation exist: that ideology and commitment to a tobacco-free world drives the regulatory climate. The simple fact is that if pharma money (and to a lesser extent cigarette trade money) was not available, there would not be any bans or proposed bans. Pharma certainly needs the boots on the ground to do their dirty work for them, and rewards them well; but if that money were unavailable, then no bans would be enacted. There would certainly be a number of unfunded nutjobs out there but that is not the reason there are bans; the reason is that money provides the power to do the work. This is not some kind of unsupportable conspiracy theory, it’s just basic business: if someone is going to take €100 billion away from you then you pay out €1 billion to stop that happening. Without the funding, there would be no WHO lies, no EU lies, no powerful tobacco control industry. It’s just business. And because the money powers the ‘negligent’ legislation (your description), I think my description is better: ‘murderously corrupt legislation’ – because that’s what it is. I have had exactly the same argument with Bill Godshall, who basically holds your opinion: ideology is behind it all. It may be, but behind that is the money that facilitates it. This is a business issue, not a health issue; public health advocates such as yourself do not appear willing to allow that. At the end of the day, the health issues are irrelevant – this is all about business. However I don’t argue at all that you need to change tack, since we certainly need your erudite approach to the science base. Just that these issues will not be decided by you or anyone else based on the health arguments, since these are clearly irrelevant when the EU can introduce legislation that will eventually kill 50 million people (an estimate based on an adaptation of John Britton’s ‘5 million’ number). This will be decided between businesses, allowing for the fact that government itself is a business, and that public health vs 100’s of billions is a no-contest – the money wins every time. Your convincing and well-backed arguments in favour of snus are for the most part also applicable to e-cigarettes. It is blindly obvious that neither politicians, pharma companies nor health research institutes are at least bit interested in harm reduction (as demonstarted by the use of snus and e-cigarettes). Helthy people are of no use whatsoever to the pharma industry or the health research sector. What can you research on or who could you sell a medication to if more and more people were suddenly healthier? Politicians just take the advice of such institutions and industrial sectors. They have more “clout” and respect than a vaper or snu-user. If anything else were the case, they would have banned tobacco cigarettes long ago. So far they are just attempting to crush all healthier alternatives. The only problem is, with the advent of the Internet, that the voters are getting better informed of the situation than ever before. This will pose a real problem for the ruling political parties in the near future. Indeed, the only reason there can be any objection to smokeless alternatatives to tobacco can be to protect the vested interests of those who make a career from the continued existence of poor health from smoked tobacco. Thank you for this analysis it clarifies a lot of the issues surrounding all smokeless nicotine products and shows what we are really up against. In another life Inactually worked in tobacco control at arpund the time you were at ASH. I think most of the profession at that time were certainly guilty of the types of “lesser negligence”. I think this negligence was predicated on a willful arrogance, that it was only through are efforts that people could be free from tobacco and only we were qualified to decide the means by which it was appropriate to stop smoking or use nicotine. I remember the lunacy of not being able to promote patches or gum to pregnant women instead they were left to quit or smoke, also prescription NRT was withdrawn of people did not attend group meetings regardless of their having quit or not. As i recall all the tobacco control measures implemented really failed to make any significant in roads into reducing smoking prevelance. Tobacco control measures seemed to be evaluated in terms of increasing tobacco control activity with no reference at all to its impact on behaviour, to the ridiculous extent that the number of dedicated bins for fag butts being on the increase was presented as a leap forward for public health. All this is to say that certainly at an organisational level activity rather than result is important for departmental empire building and this leads to negligence. As far as Public health work is concerned it does not do at all the public at large to do the job for themselves. Is it still at the Hague that people are tried ‘For crimes against Humanity’ ?